Batata poha, a traditional Maharashtrian dish is an all time favorite breakfast option. 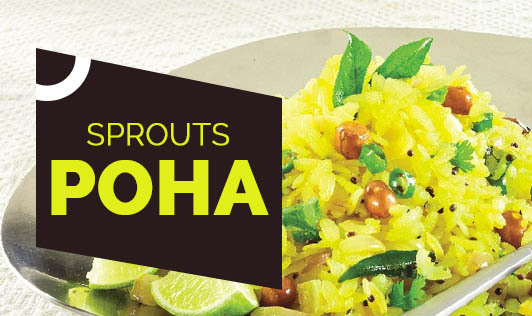 Make this high - carb recipe rich in protein by replacing potatoes with nutritious sprouts. • Wash the rice flakes lightly in a sieve. • Drain the excess water and add salt, sugar and turmeric over it. Mix it gently and keep aside for 10 minutes. • Heat oil in a non stick pan. • Add mustard seeds in the hot oil and let it crackle. • Now add the onions, green chilies and curry leaves and sauté till the onions turn soft. • Add the boiled sprouts, hing and mix for 2 minutes. • Finally add the rice flakes and mix well. • Cook for 2-3 minutes, while stirring continuously. • Garnish with fresh coriander. • Serve hot with a slice of lemon.